On a recent trip to Huntsville to run a few errands, JD, Rob and I had a spirited debate about where we should eat lunch, and by spirited, I mean it involved a championship round of paper, rock, scissors. We were each playing for our choice. Rob is lately on an oysters kick, so he was wanting to go back to Wintzell's or Cajun Steamer. I wanted to check out a burger joint called, Smash Burger. 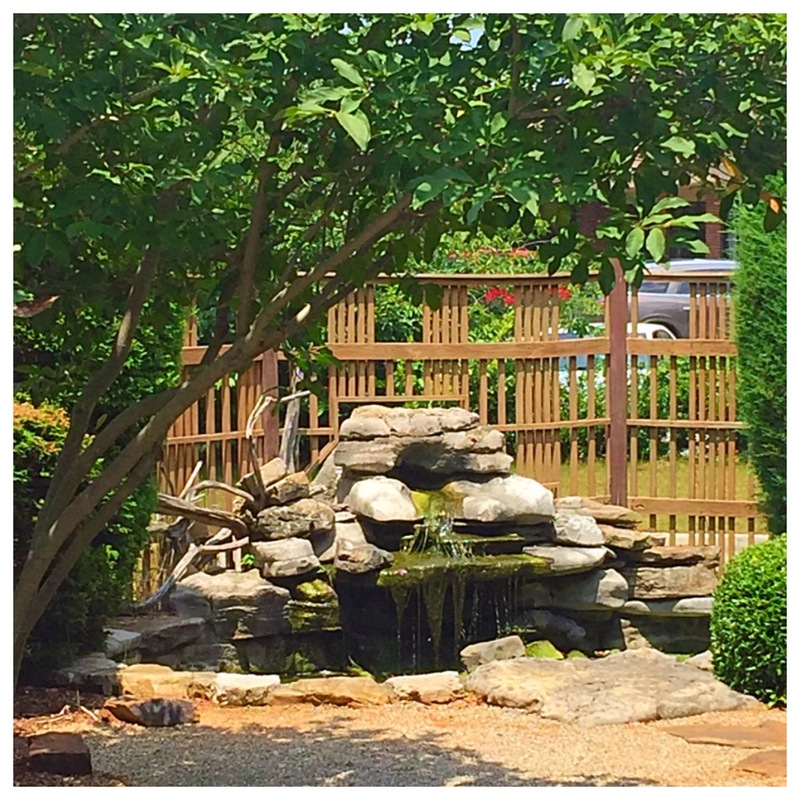 JD had his heart set on Japanese cuisine. I am still not exactly sure how we ended up at Edo Japanese Restaurant in Madison, because I won the aforementioned paper, rock, scissors war. I think Rob is still a little perplexed as well. 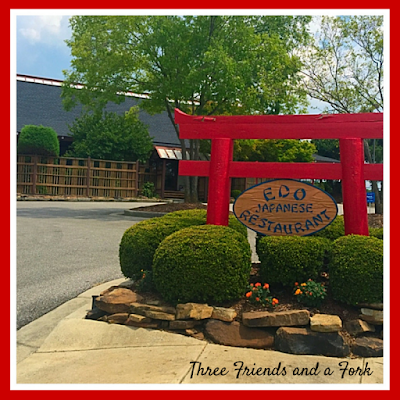 Edo Japanese Restaurant opened its doors in 1988, so it has longevity going for it. We figured that was a good sign. Ir is a bit hard to find, because it sits off by itself behind a strip mall. 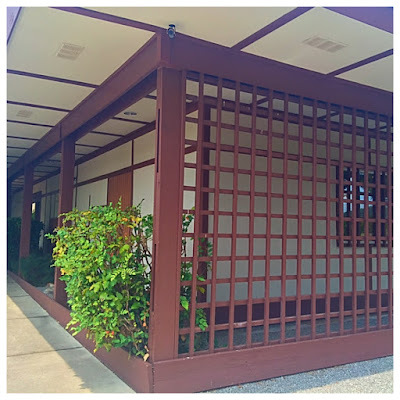 But aided by Google Maps, we managed to wend our way into the Edo parking lot. We were seated in a booth as soon as we entered Edo's doors and our servers quickly took drink orders. We also chose an order of Nightbane sushi as an appetizer. 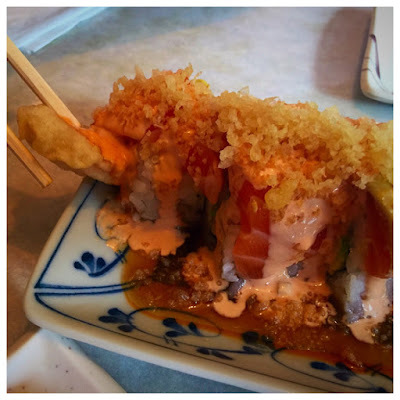 Nightbane is rolled with shrimp tempura, crab stick, avocado and cucumber on the inside and topped with fresh salmon, tempura crumbs, sesame seeds and spicy mayo. The entire roll is then plopped down in a puddle of Edo's hot and sweet sauce laced with a spicy roe. If you don't remember another thing from this post, remember this one word...Nightbane. This is far and away the best sushi I have ever put in my mouth and I will go back to Edo for this and this alone. Sadly, of the 8 slices on the plate, I only got one of them. The two little pigs I was with devoured them before I could go back for a second slice. Yes, it was THAT good! Nightbane hit all the flavor notes, sweet, salty, spicy, umami. Delicious! JD, who has had much more sushi than I, said Nightbane was the best sushi he has ever had on the mainland. 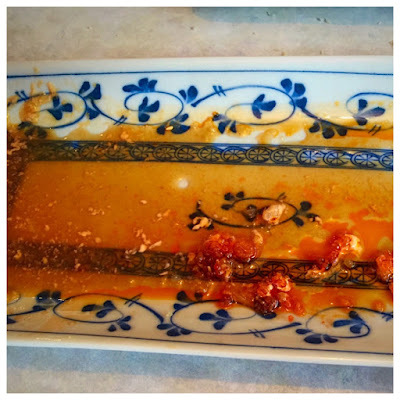 This was what our plate looked like when we finished the sushi roll, but it is not what it looked like by the time the server took it away. See that puddle of sauce and roe? It was all gone by the time the plate was removed. In fact, it looked pretty clean by the time we finished with it. 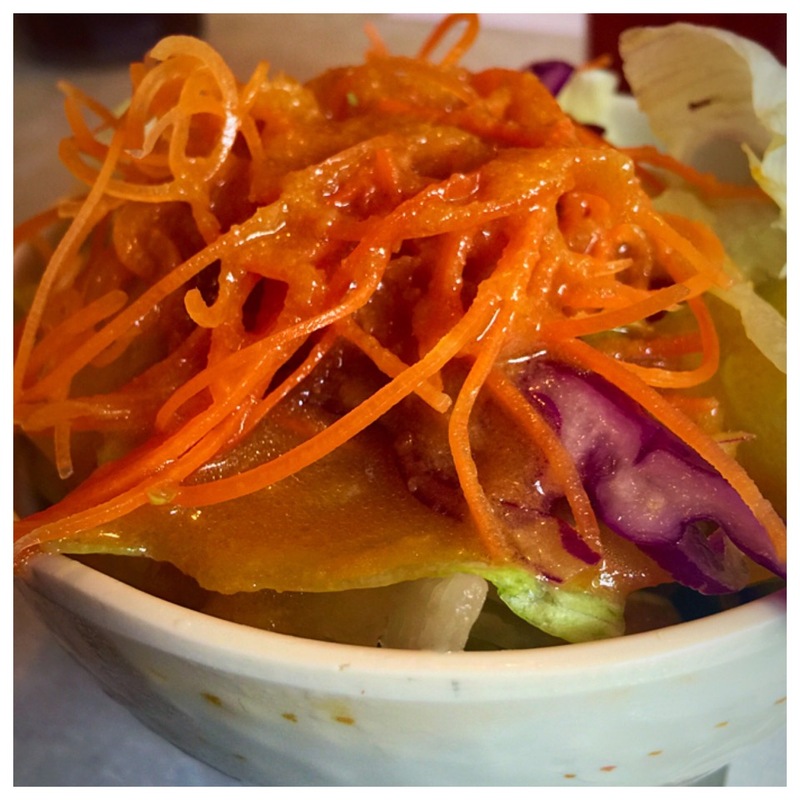 With our appetizer out of the way, we were ready to dig into our Japanese favorite...salad with ginger dressing! Edo did not disappoint. In fact, we really liked Edo's version of the classic ginger dressing. It was much less creamy, lighter, and even more flavorful than others we have tried. For our entrees, JD and I decided to build our own plates with some al a carte choices. 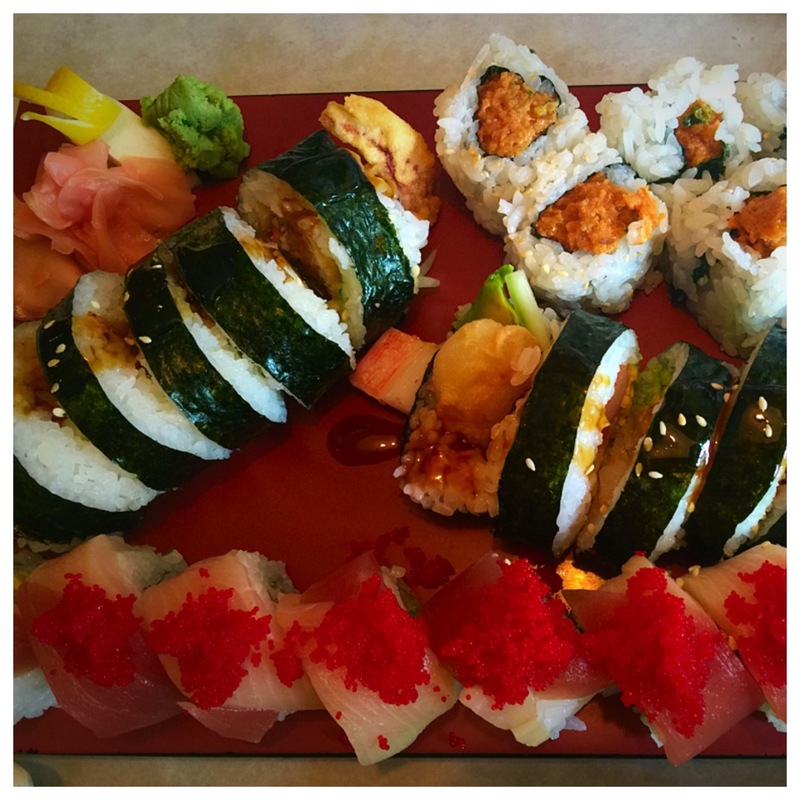 Rob chose to go sushi all the way. 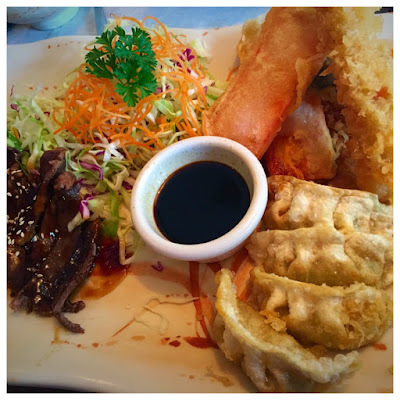 JD's plate consisted of sliced ribeye, shrimp and vegetable tempura and gyoza. My plate combined shrimp tempura, gyoza and spring rolls. JD said his ribeye was tender and delicious. It was all good, but none of it rose to the tastiness of that Nightbane roll. Did I mention it was THAT good? Rob ordered more sushi and even though JD had built a plate, he also got some more sushi. Their choices included spicy tuna roll, spider roll, crunchy shrimp roll, scallop tempura roll and a Mars roll. The Mars roll had crab stick, avocado and green onion rolled up and topped with tuna, yellowtail and fiery red habanero flavored smelt roe. 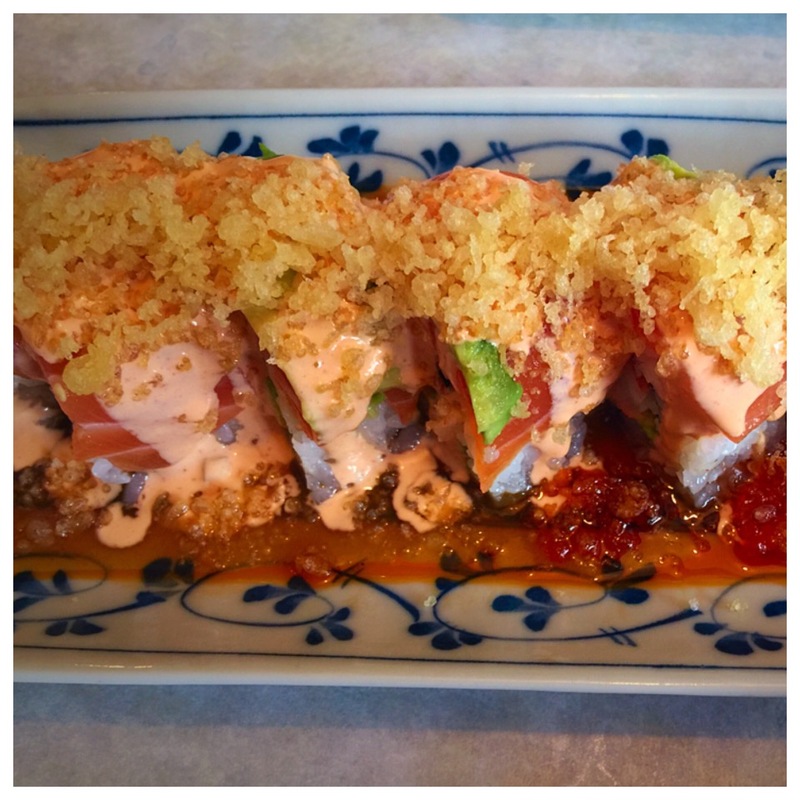 JD liked the Mars roll best, but Rob favored the crunchy shrimp and scallop rolls. All of us agreed none of them were as stellar as the Nightbane roll. Have I told you just how good that was? 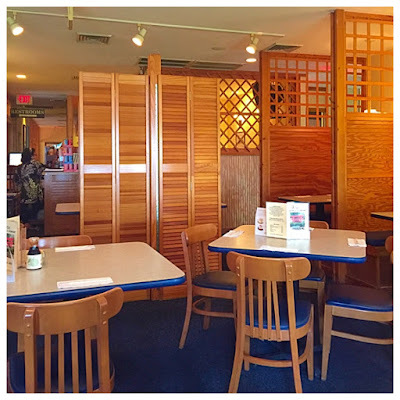 On an extra happy note, Asian cuisine, as much as I like it, often it does not like me and I find myself in great pain after a meal of Chinese, Japanese or Thai food. The food at Edo left me with no such discomfort. I was really excited about that! 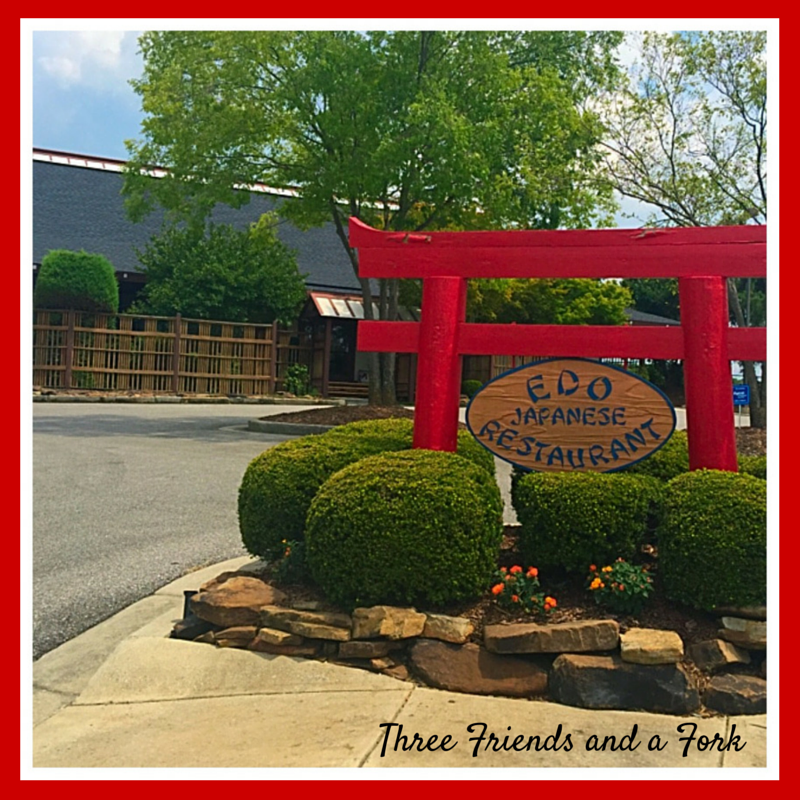 Three Friends and a Fork give Edo Japanese Restaurant 3 Delicious Yums UP....especially that fabulous Nightbane roll. If you visit Edo, do not forget to order a Nightbane roll all for yourself. You will thank me!